COLE-Parmer says its TerraSpray rinse station is a cost-effective choice for cleaning all types of vessels and carboys up to 200 litres. The station requires no electricity and simply connects directly to a laboratory’s water inlet and drainage. The compact design fits even small spaces on the laboratory bench or floor, eliminating wet spills and slipping hazards. Countertop and floor-standing models are available. 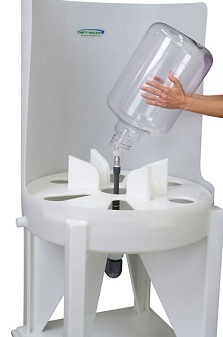 The countertop unit cleans vessels up to 38cm diameter, operated by a hand-controlled valve on the side. The floor model cleans vessels up to 48cm diameter and uses a foot-controlled valve on the platform to turn rinse on and off. The units have a moulded polyethylene top panel and fabricated base and legs.